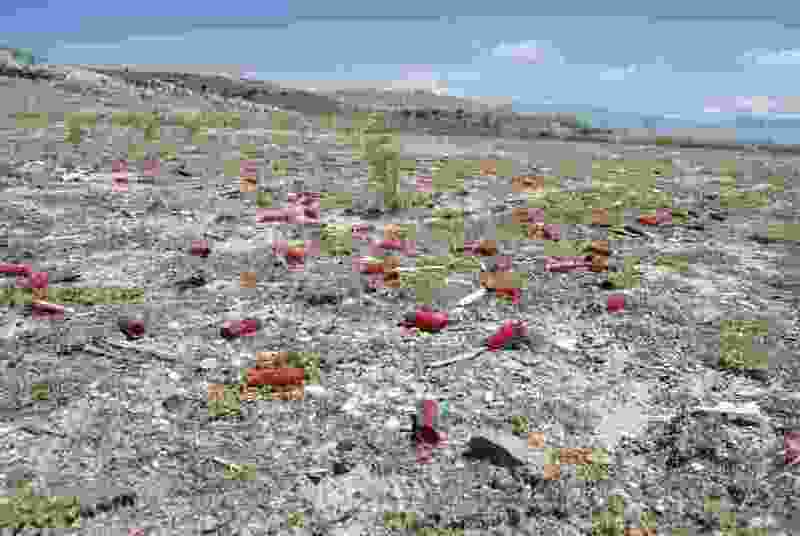 Brian Maffly | The Salt Lake Tribune Shotgun casings litter a shooting area at UtahÕs Lake Mountains, where the BLM has began crafting a new plan to manage target shooting. With the blessing of local officials, the U.S. Bureau of Land Management has banned target shooting on more than 2,000 acres on Utah Lake’s western shore, where unregulated gunfire has damaged rock art, sparked fires, threatened public safety and left a spiderweb of tracks and bullet scars on boulders, trees and other natural features. Public lands along State Road 68 have long been a favorite spot for practicing marksmanship, but now about 50,000 people a year visit this area to shoot, often hauling in appliances, televisions and vehicles and leaving their obliterated remains behind along with countless casings and other pieces of “trigger trash.” Stray bullets crossed the highway, while ancient petroglyphs were covered with paint that exploded from cans illegally used as targets. After bullet strikes ignited a wildfire in 2012 that threatened Saratoga Springs, the BLM imposed a temporary closure on 900 acres and started developing a shooting management plan a few years later. On Thursday, it released a final plan after three years of give-and-take with Utah County leaders and target shooters. The final decision, which does not limit hunting, scales back the 3,450-acre closure proposed in a draft plan released two years ago. “Some of that 3,400 acres wasn’t necessary to ban shooting to meet our objectives. Our goal was to minimize the prohibition to the smallest area possible,” said Matt Preston, the BLM’s Salt Lake field office manager. The agency confined the closure to sites along the highway, next to a formal firing range under development, and near petroglyphs chiseled into the rocks hundreds of years ago by Fremont Indians. 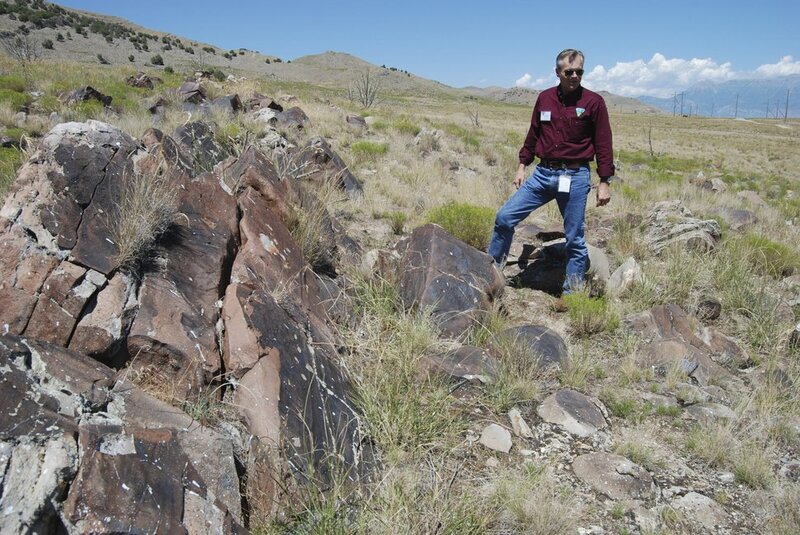 Brian Maffly | The Salt Lake Tribune Mike Sheehan, a BLM archaeologist, describes ancient petroglyphs at UtahÕs Lake Mountains that have been damaged by gunfire. The Utah Shooting Sports Council had panned that draft plan, arguing that it would unnecessarily punish law-abiding shooters who frequent the spot less than a half-hour drive from Provo and Draper. On Thursday, the group’s chairman, Clark Aposhian, said he was not familiar enough with the final plan to offer comment. Complicating the picture is the area’s landownership pattern that interweaves federal, state and private land. The largest property owner, the Utah School and Institutional Trust Lands Administration (SITLA), closed 1,500 acres in the wake of temporary closures on neighboring federal land that displaced shooters onto state land. Those lands will remain closed to target shooting but are open to hunting and other recreational uses. The county is expected to play a larger roll managing recreation there under an agreement that is soon to be hammered out with state and federal officials. 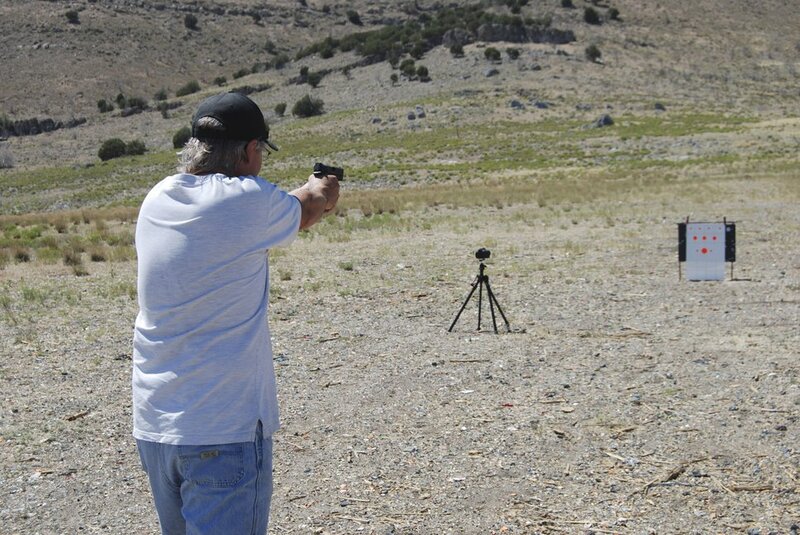 In a related development, the BLM deeded a 160-acre section to Utah County for a public firing range. That facility on Soldier Pass Road is nearing completion and is available for limited use. Brian Maffly | The Salt Lake Tribune A man, who identified himself as Tony, takes aim at paper targets with a 9mm handgun on public lands west of Utah Lake. The Bureau of Land Management has initiated a public process to revise a management plan on a 9,000-acre area on the Lake Mountains to help curb impacts associated with target shooting, including dumping, damage to ancient rock art, wildland fire, and threats to public safety. Stray bullets are known to have crossed State Route 68 and to have struck cows and a residence. The BLM shooting ban took effect Thursday, and the agency anticipates stepped-up patrols and outreach to inform the shooting public of the new rules. Despite these closures, shooters still have places to set up targets, although they will have to drive a little farther. The majority of the 3.3 million public acres administered by the BLM’s Salt Lake field office remains open to target shooting. The 90,000 acres closed to this activity overlap with recreational sites, such as a nature preserve in the North Oquirrh Mountains, the Clover Spring and Simpson Springs campgrounds, and the Knolls and Fivemile Pass off-roading areas.